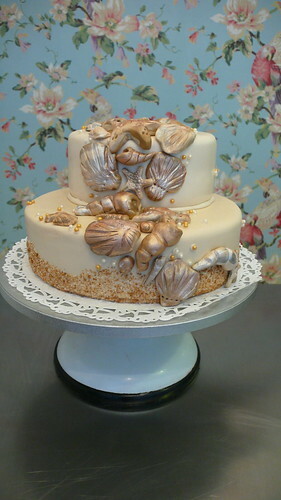 Beach Shells theme cake, a photo by CAKE Amsterdam - Cakes by ZOBOT on Flickr. Wedding cake for beach/sea/diving lovers! The design was based on a pervious design/cake of mine, but this time I handmade the large shells and dusted them with bronze, gold and pearl luster dust for a elegant finish. Flavor : Chocolate Cake with Chocolate Buttercream and Fresh Raspberries.